When I first read Overdressed: The Shockingly High Cost of Cheap Fashion by Elizabeth L. Cline, I was 2.5 years into sewing ties for Fly at Risk and 16 years into my obsession with design. While I loved the creative construction of garments and accessories, I realized I had turned a blind eye to the brutal, ugly side of fast fashion industry. This industry has twisted the art of design and personal style into a multi-trillion-dollar cash cow, which has grown drastically in the past decade. Corporations have convinced consumers that we need to keep adapting to trends that change weekly, and collectively, we have fallen into a trap of easy disposability, with the average shopper in the US purchasing 68 items a year, according to Cline’s research. When we can pay $3 for a t-shirt and $10 for a pair of jeans, it’s no surprise that this clothing is designed to fall apart quickly. As a nation, Americans throw away a staggering 12.7 million tons of textiles every year, half of which are plastic-based fibres in the form of polyester and acrylic. The so-called supply chain “innovations” that allow such a quick turnaround from the design stage to storefronts are based solely on speed, dependent on the fast-paced sweatshop conditions of overseas factories. In Overdressed, Cline states that garment workers in the United States are paid more than 38 times Bangladeshi garment workers. This means that Americans doing the same job as Bangladeshis earn $1,660 compared to $43 per month. Many of the factories in Bangladesh also hire child workers, with approximately 3.2 million labourers between the ages of 5 and 171*. Learning about the environmental and ethical issues that many clothing companies – Zara, Forever 21, Urban Outfitters, to name a few – are tangled up in made it easy for me as a consumer to simply stop shopping at these stores. Taking this one step further, I didn’t allow myself to buy from companies that didn’t have a transparent supply chain, instead choosing to purchase second-hand. However, it took another year before I adapted my business to be considerate of the new information I was armed with, and looking back now, I don’t know what took me so long. April 24, 2017, marked the fourth anniversary of the Rana Plaza factory collapse in Dhaka, Bangladesh, a catalyst for consumers to finally realize the plight of garment workers across the globe. Over 1,130 workers were killed as a result of factory owners’ negligence in this tragedy that could have been easily avoided. Activists and conscious consumers are constantly asking, “what can we do better?” to alleviate the pains caused by the fashion industry. When I started Fly At Risk back in 2013, it was just a fun side venture. It’s still exactly that, but making my way through my commerce degree and realizing the systemic injustices found in so many different industries have led me to discover that I can’t be passive with my business. Similar to my personal purchase decisions, the economic climate has forced me to be deliberate with what I choose to support through Fly At Risk and how I go about doing so. With the knowledge that fabric is clogging up our landfills, I shifted towards zero waste production in January 2017, finding new ways to use up all of the scraps I used to throw away. 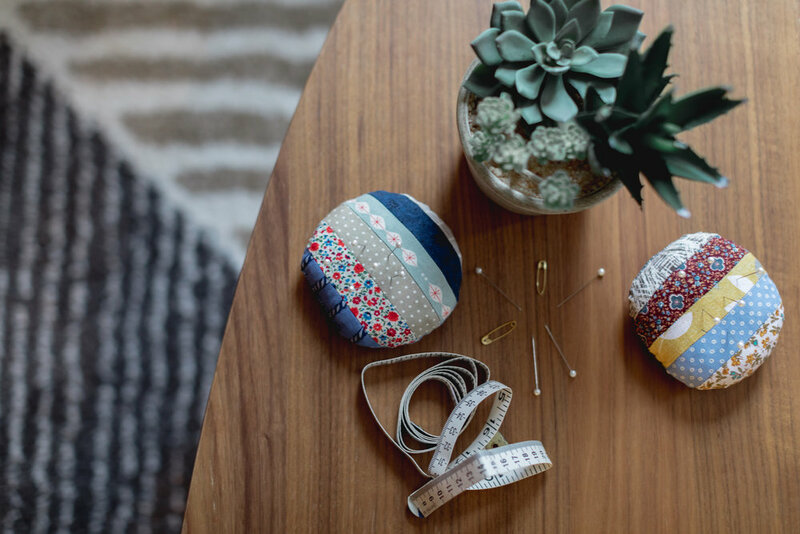 The first project I undertook was pincushions, crafted using leftover cotton from ties and stuffed with all the threads and tiny pieces that couldn't be used for any other purpose. I started selling these at Hunter & Hare, my favourite shop in Vancouver, with 50% of proceeds going towards the Clean Clothes Campaign, a global alliance committed to improving factory conditions and empowering garment workers. I can't wait to think of more ways to use up all of my fabric waste, and any ideas you may have are warmly welcomed! In the scheme of things, the steps I’m taking are a drop in the ocean, unnoticeable in comparison to the complicated supply chains of clothing corporations that move billions of dollars around every year and affect the lives of millions of workers. However, I believe that every seemingly tiny effort can contribute to a greater good. Entrepreneurs have both the unique opportunity and the responsibility to take a stance on complex issues that we face in our every day lives, sharing their beliefs and values with customers and anyone in their circles. We can do better, a fact that will never change, and it’s up to small business owners to do something about it. Interested in receiving (very) sporadic updates? Subscribe to the Fly at Risk newsletter below or follow us on social. All photos by Gracia Chua Photography, unless noted otherwise.